Emails ending with a signature are the trend nowadays. 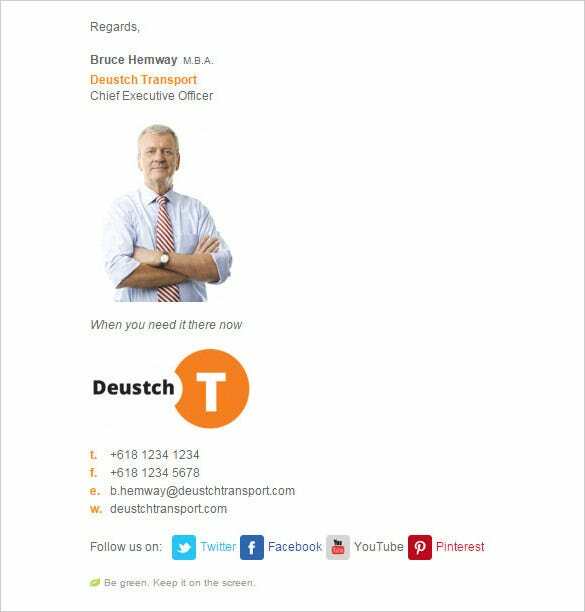 Be it personal mails or official mails, there is an email signature specified in all of them. 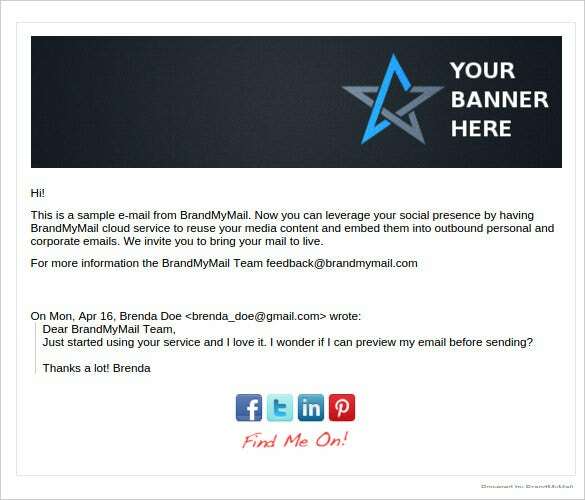 For many, it is still a new phenomenon and if you’re one of them, we’d suggest you take advantage of an email generator template. 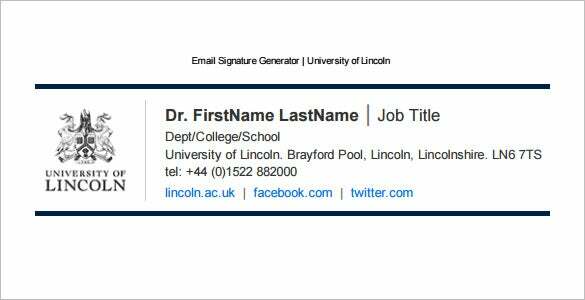 Set your email signature, and every time you send a mail, the system with ensure that it generates and attaches a signature in email which is sent from your email account. 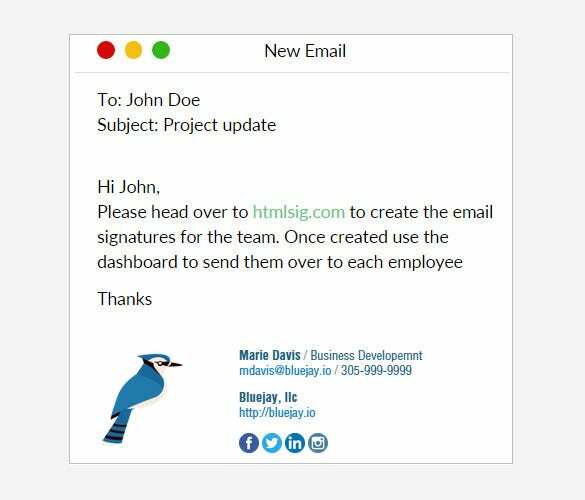 You can also email signature templates. 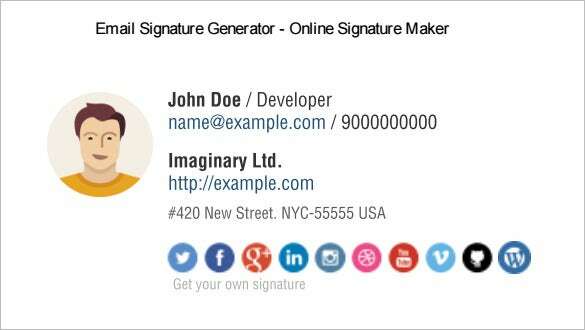 Use this free HTML email signature generator to randomly create custom email signatures that you can use in all your email communications, featuring image placeholders and social media widget support. 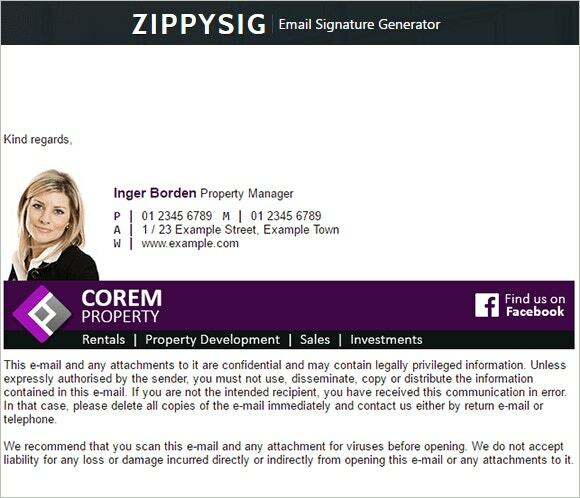 You may also check out here Corporate Email Signature Templates. 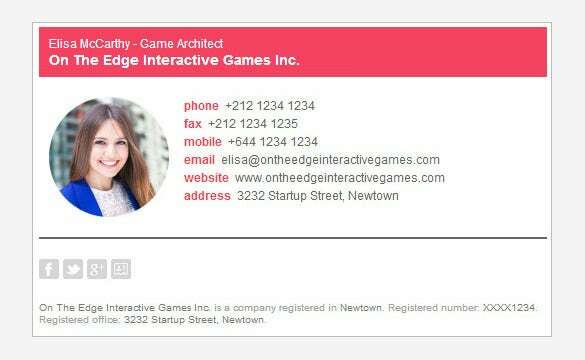 Check out this particular email generator template, it is one of the best in the online market place right now. The template is easy to operate. 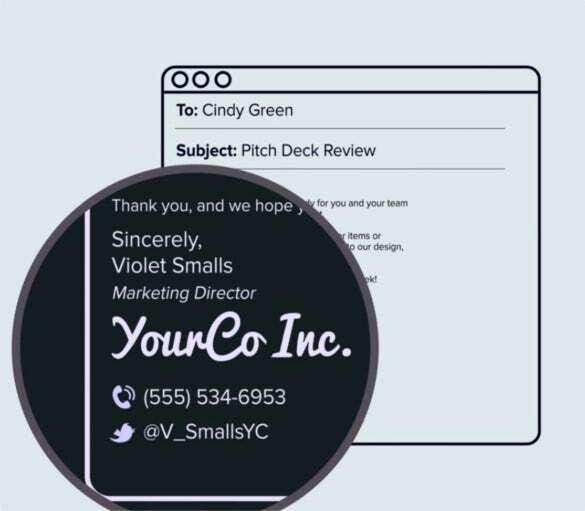 All you need to do is insert your name, job designation, and other contact information, and the template will generate an email signature on its own! You may also see Responsive Email Signatures. 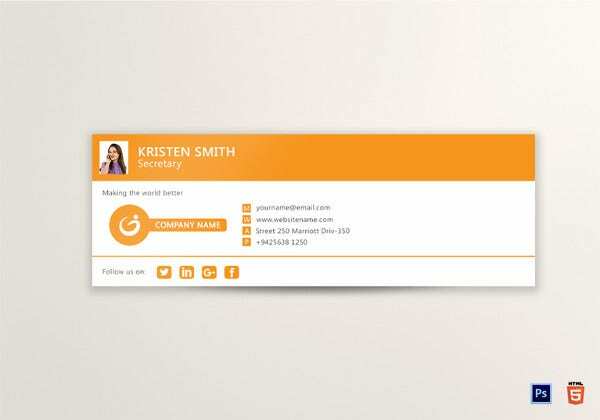 Download the WiseStamp email signature generator that is the perfect example of how a professionally created email signature generator should work, by creating stunning signatures with minimal inputs. 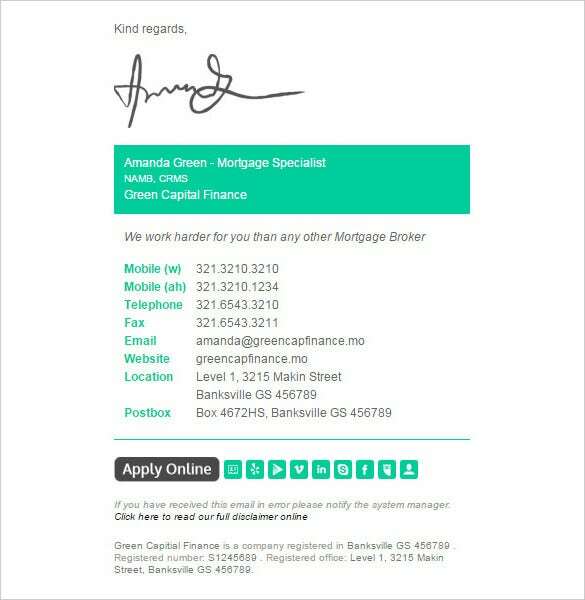 You may also see Professional Email Templates. 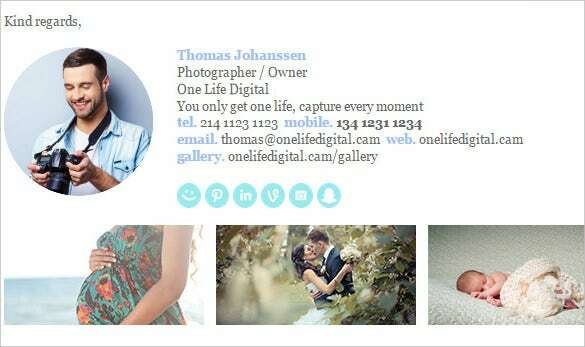 Do you need to create email signatures? Well, email signatures are really important to assure an easy communication with your clients and target customers. 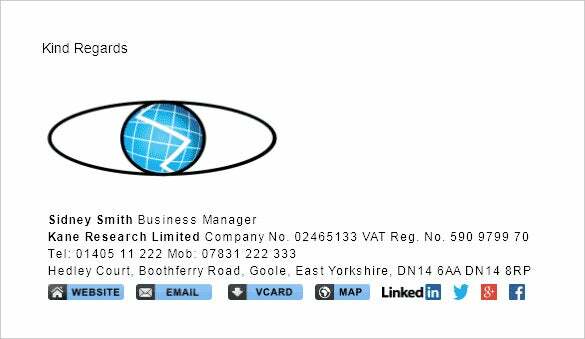 These email signatures come up with your contact details, company name and designation so that your customer know how to get in touch with you when they are not getting your replies over email. 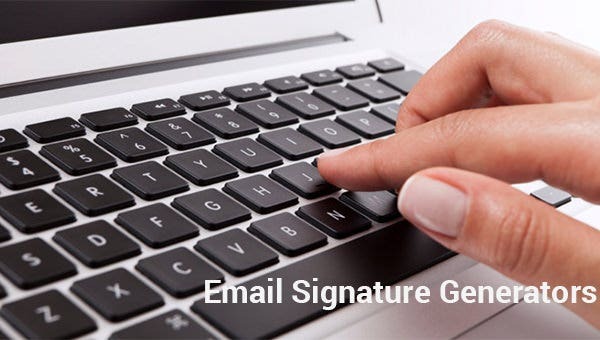 You have html email signature generator to help you with creation of email signatures. Though many ignore the importance of email signatures yet, these are really important to establish a professional impression for your company or your designation in the firm. A rich customer experience is crucial for the reputation of any company and a clear easy communication plays a major role here. 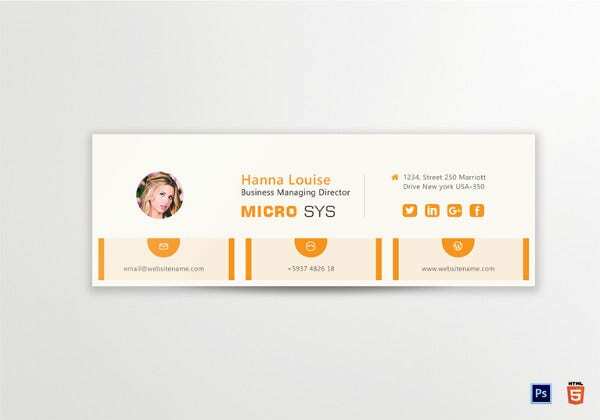 Thus, when your customers are unable to reach you through emails, the additional contact details on the email signature will ensure the desired seamless connection between you two. You may also see Top Business Plan Maker, Tools & Software. 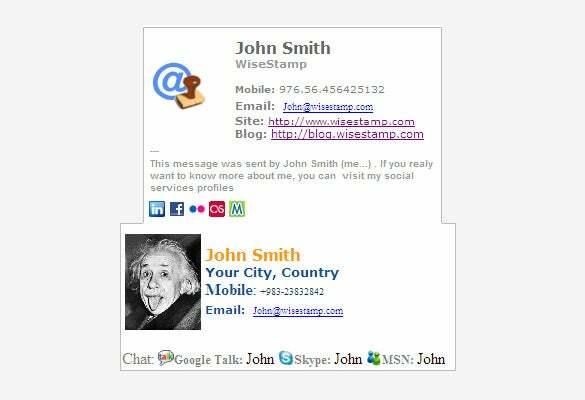 Your email signature is a part of your professional identity to the customers and hence you have to be really perfect here. But a standard email signature will demand pure technical knowledge when you have to create email signature online entirely from scratch- which becomes a problem for those who are not that tech-savvy. 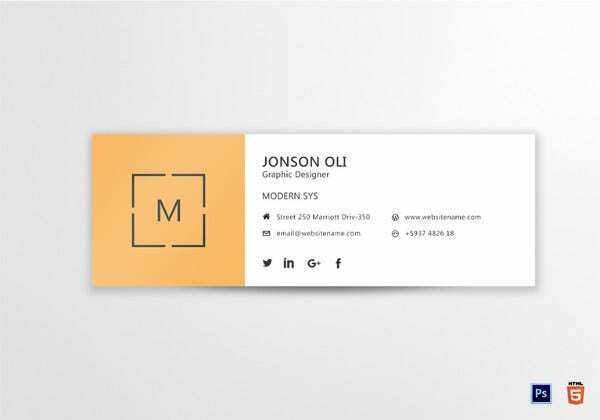 The good news is that you have emai signature makers today that come up with ready-made email signature templates so that you don’t have to do anything. 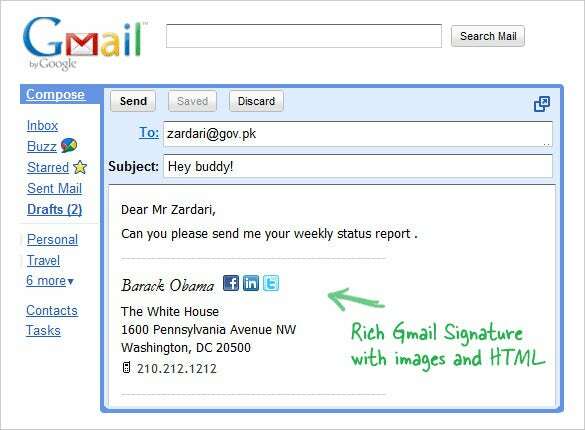 You would simply need to download the gmail signature generating tool and customize it with your own data. Then, you would just need to print it out. Yes, it’s this simple. 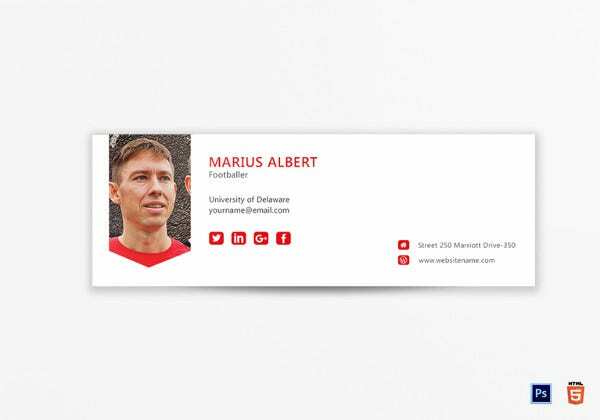 The good part is that you can even come up with free email signature templates. 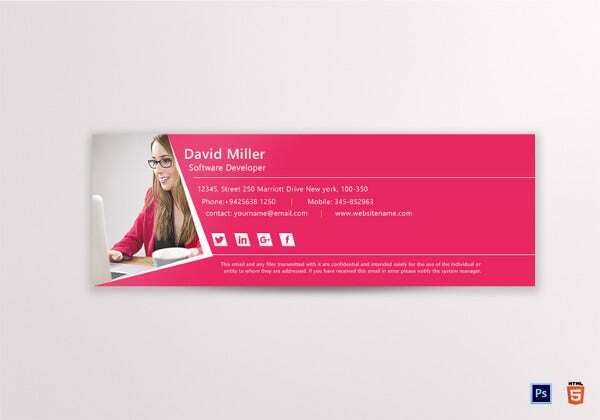 The templates range from crisp professional to the vibrant personal. They help you develop your personal style of signature and make you aware of the current market trends. 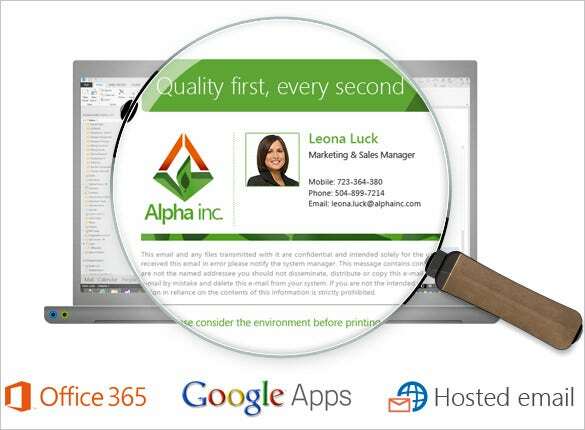 The formats are flexible and can be used across all platforms ranging from Gmail to outlook signature template. 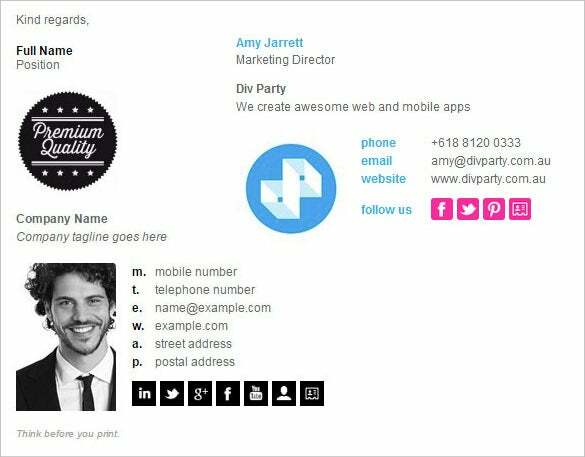 The best professional email signature should come up with your name, designation, company name, address, office phone, office website URL and your social media accounts. 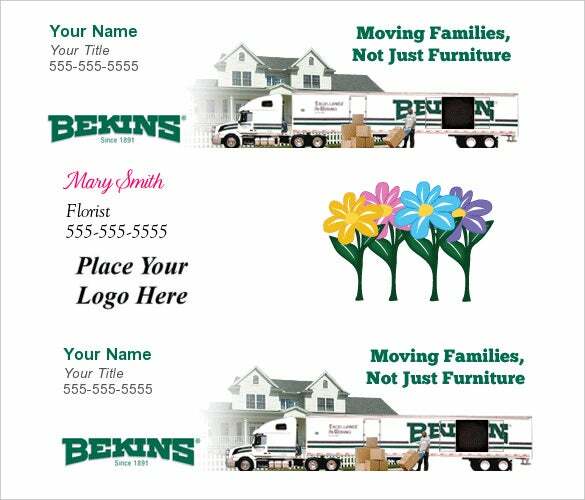 Take to email footer generator that will allow you to upload your company logo properly and also your picture. This is to ensure good branding benefits. You may also see Mobile E-mail Signatures. You can include a short inviting message or cheeky tagline. 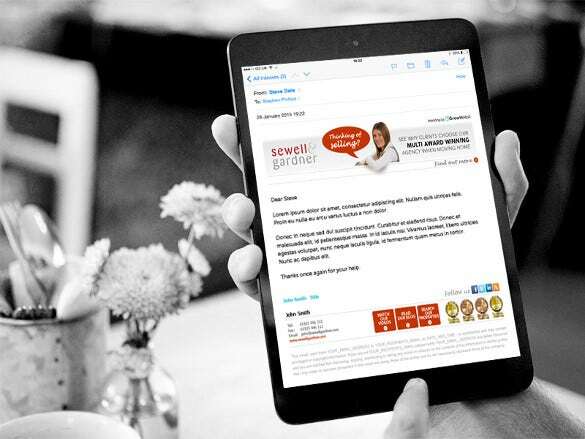 Go for responsive custom email signature so that your email signature can be viewed easily on mobile devices. It’s the smartphone generation today and hence you have to be mobile-friendly. 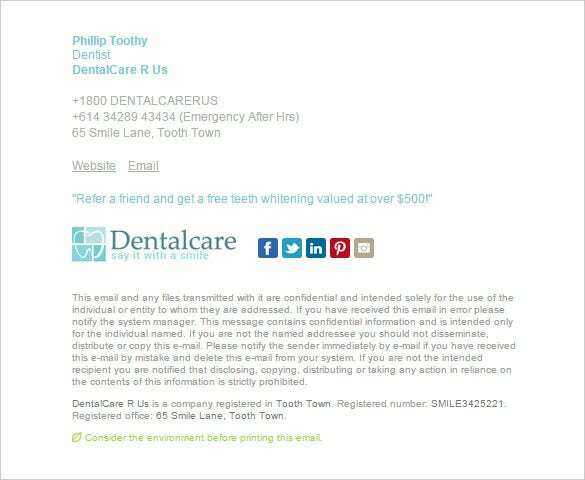 Check beforehand whether you have to include email disclaimer statement below the email signature and if needed choose your email signature tools accordingly. Remember, not all such templates come up with space for disclaimer statement. 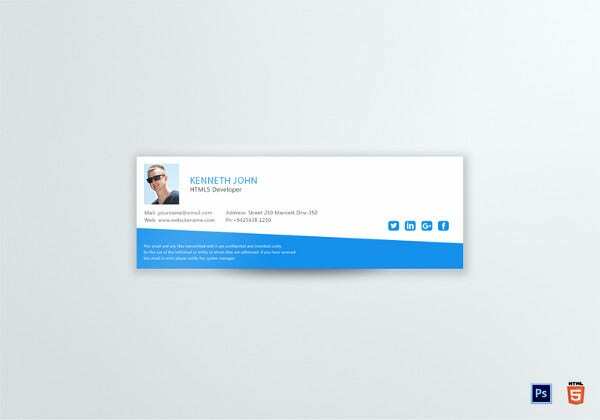 We have signature templates for any industry, any professional and our templates are all designed by seasoned professionals. 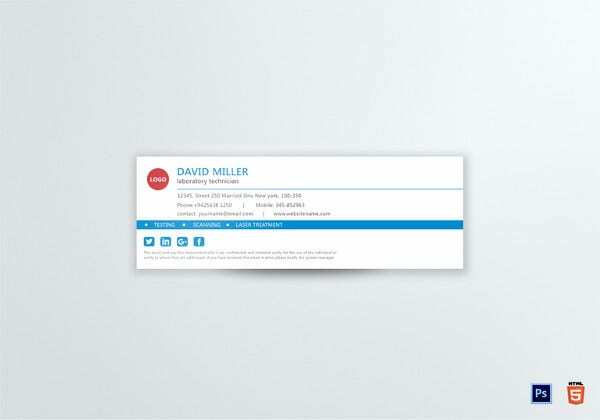 Whether you are looking for email signature bundle or individual email signature template, we have everything. Thanks to the email signature generators, you can come up with standard email signatures just like a pro, even without any coding knowledge. 10+ Best Illustrator Tools Download & Use! 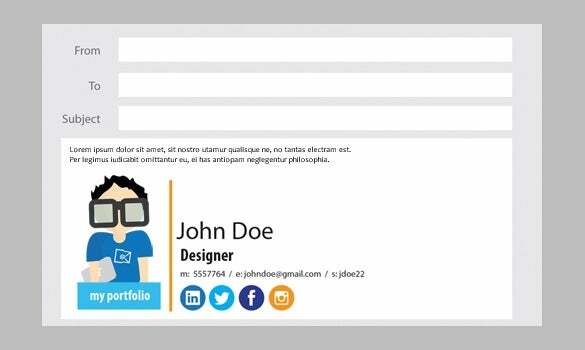 64+ Email Signature Designs Download & Edit Easily!